This is just a quick post to get something new up on this site. I upgraded my telescope to the SkyQuest XT8 and it is quite the upgrade over my old PowerSeeker 120EQ. The most obvious difference being the size, followed by the fact it’s a full Dobsonian telescope. A full size men’s basketball to give a sense of scale. 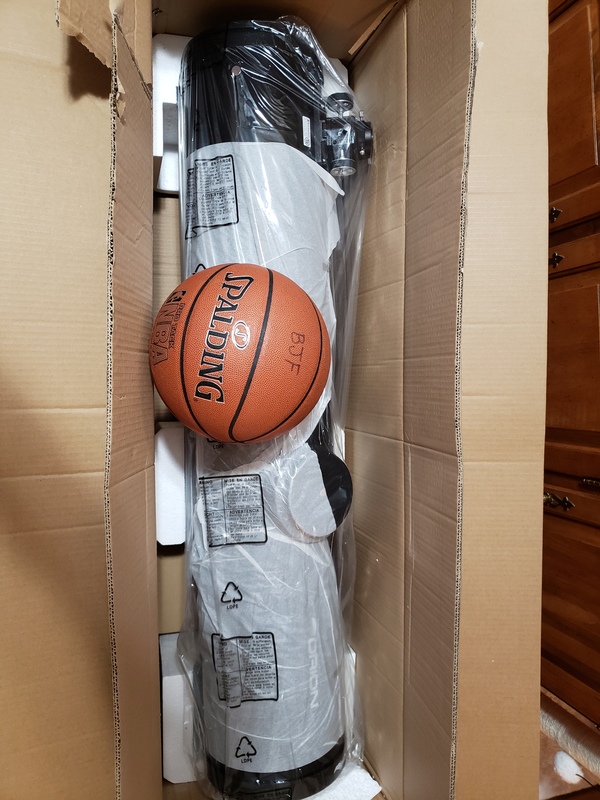 The new scope weight almost 40 pounds and is relatively awkward to carry outside the house, but once I do get it set up it’s usually worth it. However, I’ve been struck with the curse of a new telescope. There’s really only be a few “clear” nights and on those nights the humidity sat around 90%. I did manage to snap pictures of a few things over two separate nights (see below). These pictures are much improved over the ones I’ve been taking with my 120EQ, but they also don’t represent what this new telescope can really do. I’m also hoping, though it’s highly unlikely I’ll be able to manage it with my Galaxy S9 camera, to take some pictures of the faintest hint of some deep sky objects. I need to be able to see them in my scope, first, and the weather has just not granted me the opportunity. 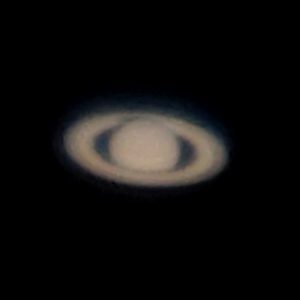 Fuzzy Saturn. Blame the dew forming on the mirror. 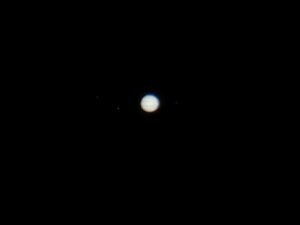 A fuzzy but clearer picture of Jupiter than I’ve been able to take before. Blame the humidity. Collimation has become my nemesis in recent weeks. The seemingly simple task of making the center of one mirror reflect another is deceptively difficult. When I first got the PowerSeeker 127EQ, I hoped this would not become a problem. It was something other people had to deal with not me. That changed when some debris blew into my scope and got stuck to the primary mirror. I tried tilting the scope and blowing it out with an air can, but it didn’t work. So, I needed to remove the mirror. I consulted the manual and some YouTube clips to see how to best do it. I undid the correct screws and carefully placed the mirror aside on a table where I could remove the debris with a lens cloth and a more direct application of canned air. I was a little excited to have a reason to clean the mirror, believing getting the shipping dust off of it would give me a clearer image than I’ve had before. While I’m sure it did help, my first look at the moon and the bright February crescent of Venus was more like viewing them through a telescopic prism. 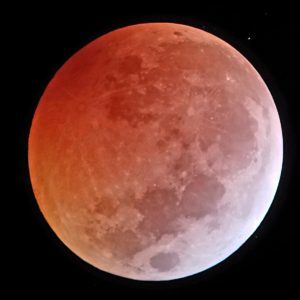 The images were terribly skewed by the “coma,” which is the technical term for the telescope reflecting a smeared and stretched image, giving it a reddish and bluish light tail. Even the moon, which is the first and easiest thing to see, was blurry and I couldn’t focus the image to make it sharp. I knew what the problem was and also knew what I read about the difficulty of collimating the 127EQ, but I believed I was better than others. I believed I could just follow the directions in the manual and do it by eyeballing things without even using a collimating eye piece. I was wrong. Peering into the open (no lens) eyepiece, I could see the reflection of the primary mirror was well off center. I made some adjustments to the secondary mirror with a screw driver. The secondary mirror is held to the scope with a single, long middle screw and angled with a triangle of shorter screws. You turn those three screws one at a time to try to center the view of the primary mirror in the eyepiece. I did that, as best as I could, but I was just making my best estimation that the image of the primary mirror was centered in the circular darkness of the eyepiece. The next step was to center the reflection of the secondary mirror inside the reflection of the primary mirror by adjusting the primary mirror. On the 127EQ, the primary mirror has six identical screws spaced out in pairs in a triangular pattern. The most clockwise of the pair is the locking screw and the other screw is the adjustment and mounting screw. Yup, the adjustment screws are what hold the mirror into the bottom of the telescope. Furthermore, the screws can really only pull the mirror tighter against the scope mounting. The pushback comes from three rubber sleeves or plugs the screws pass through. So as you tighten the screws you compress the rubber. As you loosen them, the rubber ideally expands to push the mirror out. In practice, this is really problematic. 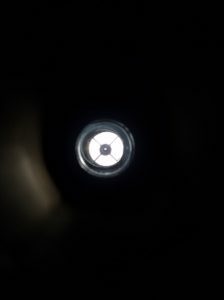 Unless the mirror is horizontal to the ground, it’s weight tends to tilt the screws and the metal disc its mounted on against the edge and mounting brackets inside the tube, meaning the rubber plugs or plugs aren’t “strong” enough to push the mirror out as you loosen the screw or screws. There’s an entire video on the web about how to replace all six of these screws with finger-adjustable wings and how to replace the rubber plugs with springs. I devised a simpler solution than replacing the plugs with springs. I know you’re supposed to be able to purchase some at the hardware store, but I didn’t figure it was worth the effort of trying to find some that might fit. Nope, I used gravity instead. I learned that the best way to adjust the mirror was to keep it horizontal to the ground so gravity would do the job the rubber plugs couldn’t do and more evenly. There is some risk of the mirror falling out of the bottom of the tube by doing this, but it’s a really small risk since you would need to unscrew all three adjustment screws completely. By the time you popped the second screw out, you should be able to recognize the peril. I found this gravity method also worked for adjusting the secondary mirror, at the risk of dropping a screw driver into the tube and cracking the mirror. Figuring I mastered the mirror adjustments and after hours of tinkering, my eyeball results improved the image, but were still inadequate. I realized I needed a tool. Despite seeing all the reviews that suggested using a laser collimator, I opted to purchase the collimation eyepiece listed in the Celestron manual. I thought it would be cheaper than a laser collimator and almost as effective. Thinking I had the problem licked, again, I slotted the eyepiece, which was recommended in the manual, and found it had two problems. First, it was too long. Unlike other reflector telescopes, the 127EQ is of the variety that needs a corrector lens in the base of the eyepiece to fix and focus the image bouncing off the secondary mirror. It’s kind of an inexpensive way of increasing the focal length of the scope without increasing the actual length of the scope or the size of the mirror. The collimation eyepiece wouldn’t slot fully into the eyepiece mount because the bottom of it would hit the corrector lens. 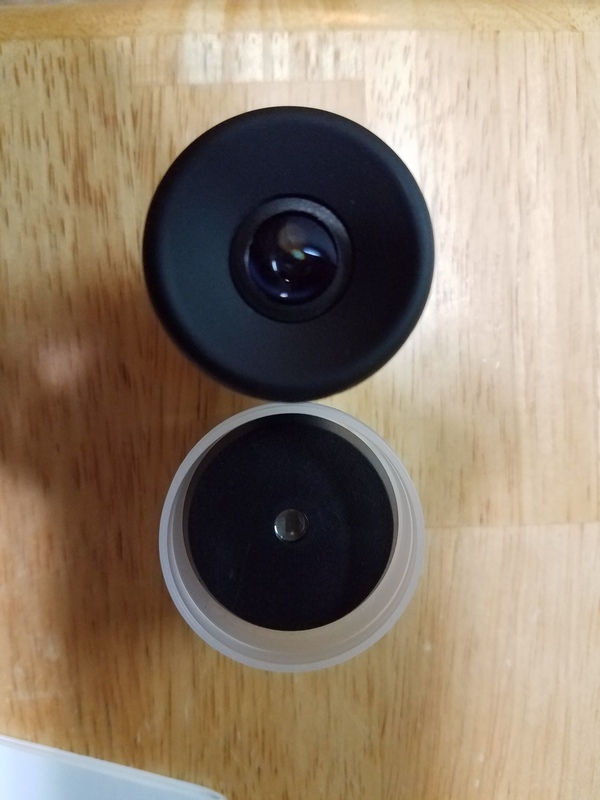 The other problem was the eyepiece tube was just a little too slender and the bottom of it was just loose enough when slotted in the eyepiece mount to move around. Meaning, I was eyeballing centering the eyepiece so I could center the image of the primary mirror so I could center the image of the secondary mirror in the middle of the eyepiece crosshairs. After many more hours, I got improved results but not enough to warrant the $30+ I paid for the eyepiece. View down the eyepiece mount of my 127EQ not very well collimated with the eyepiece tool. So, I returned it and bit the bullet. I purchased an inexpensive laser collimator, the SVBONY Red Laser Collimator, for about $25. Many reviews claimed the laser needed collimation itself because it didn’t come out of the projector completely centered. But there was an easy way to test this by rolling the pointer in place and seeing if the laser dot on the wall turned a circle of stayed mostly in place. The one I got stayed mostly in place, but because of the corrector lens in the 127EQ I couldn’t just slot it and go. Nope, I had to take apart the eyepiece mounts, remove the corrector lens, and put it back together without the lens and without forgetting the proper orientation of the lens. That done, I slotted the laser collimator and tried not to blind myself as the beam lit out of the telescope. The collimation was well off. I followed the directions as best as I could. The primary mirror of the 127EQ doesn’t have anything marking the center of it, so you’re doing your best to reflect the laser from the secondary mirror onto the middle of the primary mirror. More eyeballing. And yes, there are plenty of sites and videos about how to mark the center of the mirror with a sticky 3-ring reinforcement ring. I wasn’t even going to bother at this point. I ended up loosening the secondary mirror and adjusting it by hand before locking in the adjustment screws and then doing the same to the primary and then going back to the secondary and then back to the primary. For whatever reason, I wasn’t able to get the laser to strike the perceived middle of the primary mirror, reflect back into the eyepiece off the secondary mirror and hit the target in the laser collimator. View down the eyepiece mount of a laser collimated 127EQ. The black bump in the bottom is actually the edge of the clip on the secondary mirror. The next time I collimate the scope, I’ll fix this. But I got much, much better results. I stayed up way, way too late on a clear and very cold night to get these. The lighting conditions were not ideal thanks to a lit parking lot and neither planet was especially close at the time, but I’m still proud of what I was able to do and my view of things with my eye was inspiring and far clearer and more vivid than my Galaxy S7 can capture. Jupiter was closer than the last time I viewed it, so I was able to capture the striping with my Galaxy S7 by playing with the Pro Mode settings. The most powerful lens I used was the extra 9mm lens I purchased as part of a kit separate from the scope. Those kit lenses are by far my favorite to use. They manage decent magnifications with a great viewing area for my eye and pictures. I have the 4mm lens that came with the scope that can push it to its maximum, practical magnification of 250x, but that’s really kind of pointless if you’re getting a little more than twice the magnification at a quarter of the viewing area. Saturn isn’t especially close right now, but I managed a crisp enough image at roughly 111x magnification with my Galaxy S7. I also stayed up way, way too late waiting for Saturn to rise. So, I picked up another after market lens I’m desperate to try when the sky clears. It has the 4mm focal length for maximum magnification, but with a 10mm lens to see it through. Check the pictures below to see the comparison. It’s also worth mentioning the lens is a lot clearer than the one that came with my scope. Both lenses have a 4mm focal length. Which one do you think would be easier to peer through? My scope is collimated for the time being, but I’m not looking forward to doing it again. I spent hours figuring it out and researching it. When it comes to astronomy and this telescope in particular, collimation will remain my nemesis. And thanks to theskylive.com for providing so much useful info about the planets. I’ve been dabbling in some galactic voyeurism as of late. 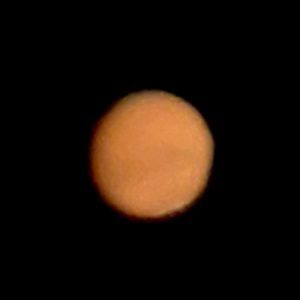 By that I mean, I’ve taken a crack at amateur astrophotography. 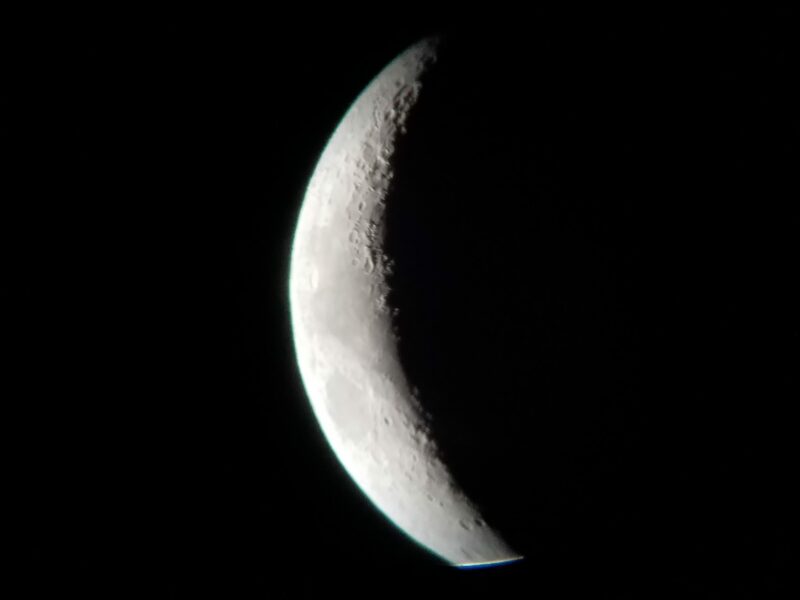 Put more simply, I’ve been taking pictures of planets and the moon through my new telescope with my smartphone. It’s not as crazy as it sounds. It’s been surprisingly easy to do and has produced some pretty surprising results. 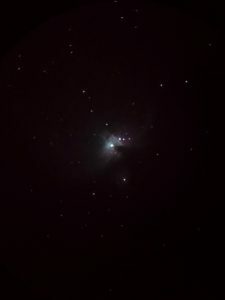 No, I’m not taking Hubble quality images, but I am getting way better picture than I have any right to. 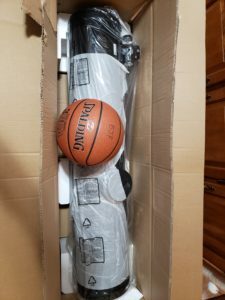 For Christmas, I was given the Celestron PowerSeeker 127EQ, which is a Newtonian Reflector type of telescope. It uses a large mirror to capture light and focus onto a smaller mirror that sends the image to a lens in the eyepiece. It has a focal length of 1,000mm, which is the big number for determining the upper magnification power limit of the telescope. The formula goes that the magnification of the telescope is equal to its focal length (1,000mm) divided by the focal length of the eyepiece lens. The scope came with a 20mm and 4mm lenses and I purchased the Celestron PowerSeeker Accessory Kit for two more lenses, a 15mm and a 9mm. So with each of those eyepieces my possible magnifications are roughly 50x, 67x, 111x, and 250x. The 15mm and 9mm lenses are my favorites to use. Included with the scope was a 3x Barlow lens, which for all intents an purposes, “zooms” in on whatever image you’re looking at by 3x at the cost of sharpness and brightness. It’s very much akin to using the digital zoom on a camera. I haven’t been too impressed with it so far and I’m curious if a 2x Barlow would produce better results. So, with all these lenses and this pretty decent amateur telescope, I set out on my adventure of exploring the solar system from my driveway. It is not an ideal location to setup a telescope with plenty of light pollution (stupid streetlight), being less than 50ft above sea level, and only have a few completely clear nights. My first target was the moon, mainly because I wanted to adjust the finder scope so that it would be properly aligned with the telescope. The most frustrating thing about using any kind of high-powered telescope is actually pointing it at what you’re trying to look at. And the more powerfully and narrower the field of view is, the faster the object you’re trying to target will move away. I took a couple of videos that demonstrate this. 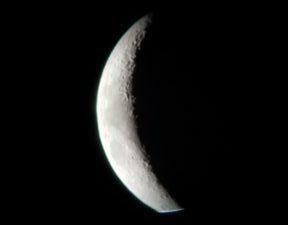 The moon is easy to find with a telescope, especially with the low magnification 20mm eyepiece. With the moon sighted, I adjusted the finder scope and set about trying a couple of different lenses. And once I was comfortable with those and operating the telescope, I broke out the handy little gadget that lets me attached my Samsung Galaxy S7 to the telescope, Gosky Universal Cell Phone Adapter Mount. Fitting my phone into it and adjusting it so the camera lines up with the eyepiece takes some fidgeting and is most easily done with a bright target like the moon and the low power 20mm lens. But it takes some trial and error. Once I got that right, I had to manage the camera settings on the Galaxy S7. Getting deep into them hasn’t been as intuitive as I would like and I’m still playing with them. The camera wants to be helpful with a lot of automatic settings and light sensors, but those things actually hinder trying to take a crisp image. I suppose I should go hunting for an app designed to set the camera settings for astrophotography. One important thing I did learn (other than disabling flash) was to set at least a 2 second time delay on taking photos and video. My telescope is actually really stable on its aluminum tripod mount, but just pressing the camera button on my phone’s screen causes slight shaking that becomes more noticeable the higher up in magnification you go. That 2 second delay lets the vibration mostly subside so I could take a clearer picture. 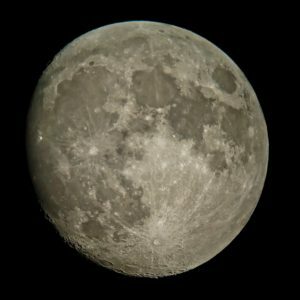 Here’s one of the first pictures I took of the moon. I believe I used the 15mm eyepiece and you can see how I don’t quite have my phone’s camera close enough to the eyepiece. That curved edge on the right of the image is the phone catching the edge of the lens. The camera’s field of view tends to be larger than the lenses I have. Taken with 15mm lens and Samsung Galaxy S7. While taking pictures, it also occurred to me that I could shoot video as well. The camera actually works somewhat better in video mode for this than in snapshot mode. Unfortunately, there’s a little noise being picked up by the mic. I need to research how to disable it for these kinds of videos. I’m going to work on getting some better pictures of the moon when it gets fuller and the weather clears up. The next picture, which was one of many I took, is of Jupiter and four of its moons, which I believe are referred to as the Galilean moons. 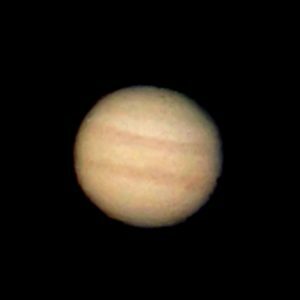 The sky wasn’t perfectly clear when I was watching Jupiter, having a slight haze to it. Again, I’m going to try to get better pictures when Jupiter gets closer to earth in the next couple of months. Taken with 9mm lens and Samsung Galaxy S7. And here’s the video clip I took of the gas giant and its moons. Notice how swiftly it moves through the lens and the field of my camera at a little over 100x magnification and about 2x digital zoom. But where are your Venus pictures, you might be wondering. Venus is the brightest object in the sky, second to the moon. Well, I’ve tried and I don’t know what gives. I got one good look at Venus with my low power 20mm lens where I could barely make out its crescent appearance. But after changing lens, it just turns into a bright blotch. One time, I think this was due to condensation forming on the telescopes mirror. Another time, I think it must have been some thin, high clouds. It should reach its peak brightness on February 17. So, I’m hoping for clear skies then so I can try to get some good pictures. Until then, I’m looking forward to more galactic voyeurism with my Galaxy phone. I mean, Samsung must have known what they were doing when they named the phone that, right?